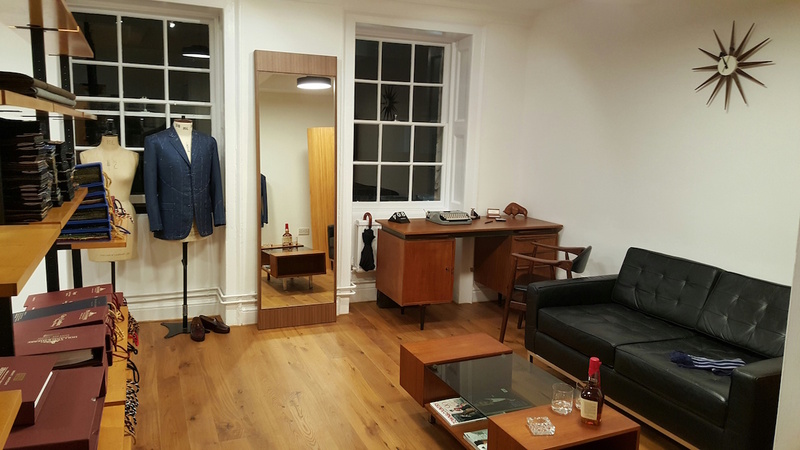 A trouser workshop for many houses on Savile Row, they have been branching out into jackets and suiting, and creating their own brand. 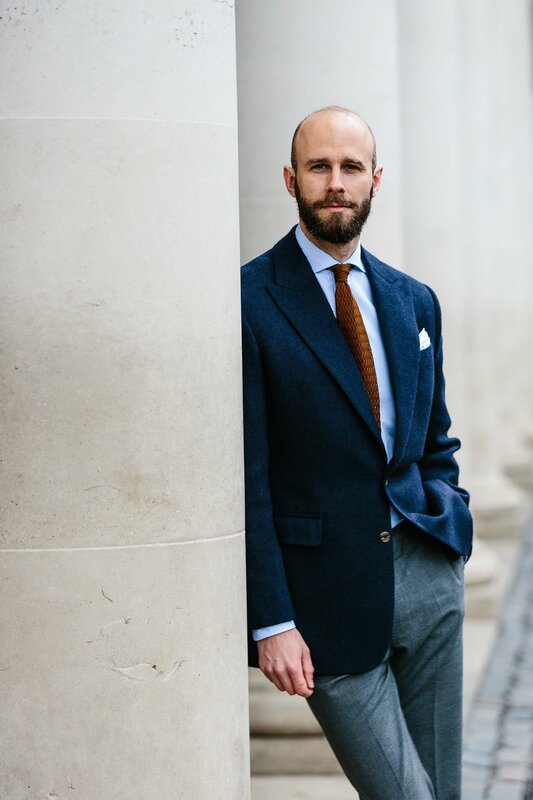 We made the navy-tweed jacket and grey trousers shown here, experimenting in the process with a jacket that is particularly strong in the upper body - with extended shoulders and generous drape in the chest. An extended shoulder uses a pad that is slightly longer than the person’s shoulder underneath. It creates an impression of breadth in the upper body, but without the padding of traditional military tailoring. Anderson & Sheppard and Florentine tailors like Liverano are the biggest proponents of the extended shoulder. It is the antithesis of the Neapolitan cut, which often has the upper arm pushing out into the top of the sleeve. Drape, meanwhile, throws excess fabric across the chest and top of the back, to add to that impression of a large upper body. It also has the advantage of being more comfortable than a closely fitting chest. If you look carefully, you can see the chest of the jacket swelling outwards (trust me, my chest can’t do that on its own): either just next to the sleeve, in the front-on images, or in the profile of the chest in the three-quarters shots. It’s also interesting to note how sloped my shoulders are without any padding (which I don’t mind) but how they still give an impression of size because of the extended shoulder line. 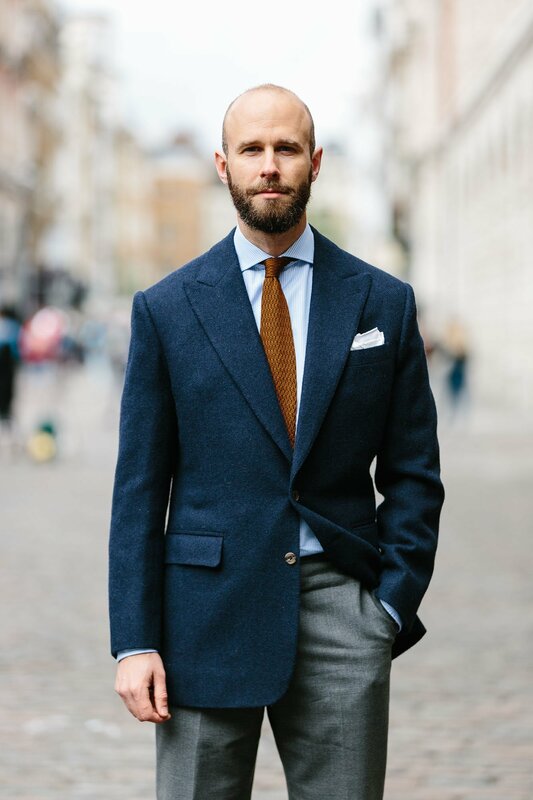 These effects are accentuated, of course, by the two-button style and peak lapels, both of which create a stronger diagonal from shoulder to waist. The Disguisery are Giles, Rebecca and Edita, plus the makers they manage in their workshop. Giles’s aesthetic, and that of the house as a whole, is American modernism, with plenty of Ivy style, penny loafers and high-buttoned jackets. But this is merely a personal tendency - they are open to any style, which is what led to our experimentation with shoulder and drape. We had a couple of issues with the jacket, around the balance and proportions of the drape, but got to a strong result in the end. I’m not sure I can unreservedly recommend it to readers, but at their price point (£1800 inc. VAT for a jacket, £2500 for a suit), it may well be worth a try for someone that is keen to try a particular style. The trousers, on the other hand, were faultless, and again at the price point (£700) they are a good option for anyone wanting a Savile Row trouser at a lower price. The finishing on both jackets and trousers was also good: fine, Savile Row-quality stitching and workmanship, without ascending to the levels of a Cifonelli or Chittleborough & Morgan. I should also add that I have found the jacket (in W Bill tweed, WB12123 12/13oz from the Classic Shetland bunch) extremely useful. It’s not quite navy in colour, but it’s dark enough to have the versatility of a navy blazer, with the tweed drastically reducing its formality. For a guy that wants something to wear with casual trousers and light-coloured jeans, but also grey flannels, it’s a great option. The trousers we made, by the way, were Holland & Sherry Crispaire, 9/10oz number 337052 CP. Copper-coloured zig-zag knit tie from Shibumi. Striped bespoke shirt from Charvet. Brown alligator shoes from Gaziano & Girling. You can follow the discussion on Drape and extended shoulders: The Disguisery by entering your email address in the box below. You will then receive an email every time a new comment is added. These will also contain a link to a page where you can stop the alerts, and remove all of your related data from the site. How much can one extend a shoulder before it goes from aesthetically pleasing to overly wide? I see that they also offer M2M chinos – do you know how much these cost? £350 with a fitting . They come in 17 colour choices . Simon, Any experience with their chinos? I believe you’ve said in the past that getting bespoke casual trousers never come out quite right. And you’re right, they rarely do. Not because there’s anything wrong with the fit or finish, but because what you get is a tailored cotton trouser – not a chino as most people understand them, which tend to be garment washed and be much softer and more casual. I have had 2 pairs made. Lovely cotton fabric, good sewing, fine construction. Also one can customize each pair, e.g. as too how many pockets and where. However there were issues with both pairs, more specifically with the length, both were too short). Also the first pair was too wide around the waist, this was altered subsequently. The chino business seems to be Giles’ corner. This is also the weakness of the model. While the contact with him is pleasant, Giles is not a tailor as Rebecca is, he does not have a tailor’s eyes and will let you leave The Disguisery with a pair that is not 100%. The problem then is that you as a customer are supposed to notice all issues during the one and only fitting, in other words you’re supposed to act as the cutter/tailor with the critical eyes. In my case the fitting in 2017 was not really worth its name since the trousers seemed so wide, they almost looked like a tent. The 2nd pair turned out much better, but they’re still too short. I’d love to order a 3rd pair, but as the model is now, the process is not optimal. At the end of the day, you want a chino that fits better than one you can buy in a high street store and what’s the point of having good tailors sew you a beautiful pair if the fit is not right and no cutter/tailor to control that fit? Do you think there jackets are likely to improve? It’s hardly suprising that, given their background in trouser making, their tousers are better than their jackets. It would be interesting to hear you views on them in a couple of years (though I can see why you might not wish to me another commision). Why do you mix a 13 oz tweed with Crispaire? They wouldn’t necessarily be worn together, they just happened to be two things I needed. Very nice looking coat, and the extended shoulder works well on you. My only style change would have been slanted pockets as I think they help a lot in elongating the torso, but that’s just a matter of taste. As you say, a very versatile piece. Notwithstanding the open weave of Crispaire, I find them to be quite heavy and capable of being worn comfortably through much of the winter. To my experience, it’s not the summer material alleged by many. Crispaire may be fine when it’s breezy outside; but otherwise, you’ll feel the slightly scratchy heaviness on a warm day. In other words, I don’t find the tweed and Crispaire inconsistent at all. Very flattering cut for you, Simon. Could we get a photo of the back? Not immediately, I’ll have to get some time with Jamie again. But I would disagree about that statement – a clean back is often harder to cut, yes, but the biggest impact will be the front, not the back. It is how most people see you, and where most design choices are made. Photos of the back can also be a little misleading, as if it allows any movement of the arms at all, it will never be entirely clean around the armpit. Simon this issue has come up with my tailor and I, he cuts a close back usually but this seemed to restrict movement of the arms as well as cause lot of pulling around the torso under the armholes. As a result I had the coat taken out slightly, talking 0.5 inches each side if that. It lost that clean back, there is mess around the side of the torso and even the front of the chest became a little messy (that excess cloth at the back creates more space which transfers to the front I assume). Im not sure how to resolve this problem. It seems you can have a clean back (and a totally clean side and front as a result) but not without sacrificing comfort. What can a tailoring aesthete do? I think this is where the talent of the cutter really shows. It is quite possible to have a back that looks clean but also being comfortable. A small excess at each side of the upper back achieves this. Hence my point yesterday that tailors really should be judged on how the back of the coat is. Getting the front, and front / back balance is a de minimis that any tailor worth his salt can do, but the back is where the “talent” is shown. If you have a look at the old tailoring handbooks (such as those on the cutter and tailor forum) they echo the same sentiment. Hence I would love to see more “back photos” on this blog when you review tailors. It would be great if the iGents of Instagram started posting such too, would be interesting to see if some of these new “internet favorites” among tailors really measure up. Thanks S, and you make good points. I would only say that it depends slightly how to define ‘clean’ – the reader above seems to define that as no excess on either side at all. 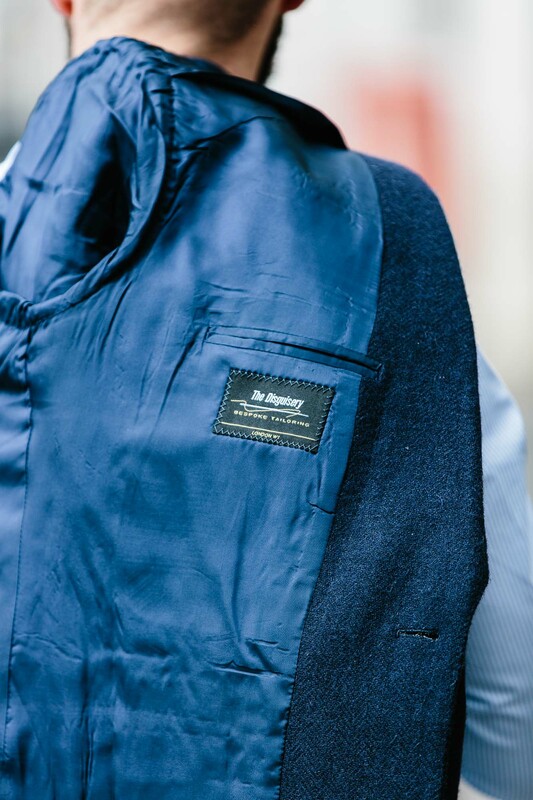 And that pictures online can be particularly misleading when it comes to the back of a jacket – one small movement, particularly in a lightweight cloth, and a wrinkle can be thrown across the whole thing. Thanks Simon. I think we agree. Photos can be deceiving, and lighting plays a big part. Indoors with down lights (ie light source from directly above) will make any back look bad (exagarate each tiny wrinkle), but natural light outdoors is usually is preferable. And completely agree as regards cloth weight, a heavy tweed is much easier to “get right” as opposed to some paper thin 8 oz Italian cloth. Hence why it is recommended that one should wear as heavy a cloth as one can bear, and for warmer weather go for a more porous weave rather than a lower weight. I have a suit made out of 13 -14 oz LL Brisa which is eminently wearable in hot weather, and indeed cooler than some 9 oz suits I have, due to the loose Fresco-like weave. Getting the back of a coat right is much harder than the front. Neck, shoulder, shoulder blade, curvature of the spine, small of back, seat, vent are way more complex than getting a clean front. And if they are off, it will blow the front, particularly if it impacts how a coat stays up on the neck. I’m considering having some trousers made, but want to choose a cloth that does ‘shine’ quickly as it wears. For example, two worsted suits I have are now noticeable shiny on the elbows and seat. As they are starting out, there isn’t a firm house style. As mentioned, they tend to go for a high-buttoning, 1950s cut, but there is lots of flexibility. 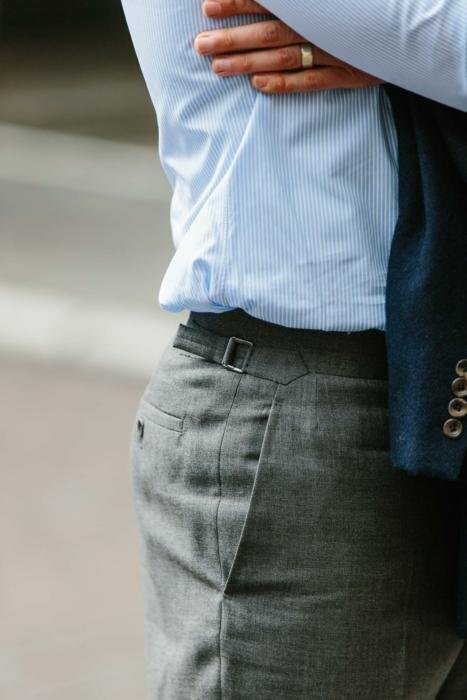 The trousers look fantastic.How do they stack up against W & S Classic Bespoke or Cerrato? Which has the best fit? Which has the best finishing? They’re very similar to W&S Classic, I would say. Both are good, quality Savile Row trousers. Of course the Disguisery ones are made in the UK if that matters to you. Cerrato is rather different – same quality level, but a different style, more hand finishing on the outside, and so on. Many Thanks for the information Simon!Appreciate it! Could I ask if the trousers are lined please Simon? In your guide to summer trouser cloths (invaluable) you mention that some people half-line Fresco trousers to guard against the “roughness” of the fabric which comprises the cooling effect of the fabric. However, from what I understand, Crispaire is a little softer to wear. Very nice! It creates an athletic silhouette without any conspicuous padding. You look like a well-dressed decathlete! Is this “drape and extended shoulders” the heir of 30s style? Very interesting topic, thank you. Drape: would have been nice to show a pic of you in a suit without drape. As it is, I can’t really see it despite your indications. Is Drape just about a louser chest or is there more fabric to allow for more breast padding and so inflate the breast? Shoulders: on some english bespoke suits, maybe more so those with concave shoulders (which I like, D Taub, E Sexton,…), one issue is that there is often a gap between the shoulder padding and the upper arm side, esp when one raises ones arm. Is this due to an elongated shoulder, a thick concave padding or only when both are combined? Trousers: the side tab adjusters seem unsually close to the pockets, which is pretty nice. Last: even though you don’t mind I think you shld always look for shoulder padding and avoid sloping shoulders. Drape – there are lots of pictures elsewhere on the site. Have a look for Cifonelli or Caliendo. There is no extra breast padding, but being looser requires a little more fabric, yes. Gaps or folds in the upper arm depend on lots of things, including the width of the shoulder, the amount of padding, the width of the sleevehead, and the anatomy of the wearer. It can be minimised, but is often not worth trying to eradicate to the cost of everything else. The “chinos” I have had made at The Disguisery are superb. The quality and fit are outstanding, but they are definitely not “khakis”. They are probably closer to dress cotton trouser but could certainly be worn more casually if you chose too. Jacket looks too big to me. The thickness of the torso is proportionate to that of the neck, which the jacket leaves exposed (duh). Also not a big fan of worsted with tweed. Extremely flattering cut. I prefer this to your Neapolitan jackets. Can someone please explain where the shoulder line of jacket should end? Should the sleevehead sit on the bone at the top of one’s shoulder, or should it protrude out so as to cover the adjacent muscular bulge at the top of one’s arm? P.S. – Couldn’t agree more that a draped chest is far more comfortable than a fitted chest. Thanks, I’ve raised the issue and made an appointment. My only concern is that you mentioned before, I think anyway, that you shouldn’t try adjust the shoulders of a finished jacket. Generally speaking, would you just note the issues for the next suit or would you ever try to fix? Have you ever made adjustments to the shoulders? Yes, but I wouldn’t recommend it. Eventually, we’ve got the post devoted to your experience with Disguisery. Thank you! The jacket is a bit rakish, but I find it really lovely. It’s therefore surprising to me as you state that you are “not sure [whether you] can unreservedly recommend it to readers”. From what I’ve read and seen from the posted pics, I don’t think I have really grasped what you meant by that. Thanks John. We just had a few issues with the fit, which meant it took longer than perhaps it should have done, there were a couple of uncertainties over the style, and even now I’m slightly unsure about the drape on one side. Not big issues, but also not the clean service there might be from a more experienced team, perhaps. With the fullness in the chest and peaked lapels, did you consider a ticket pocket? Notwithstanding your answer either way, it looks great as is. Simon – an unrelated question if I may. I’ve recently bought a couple of Boglioli suits in cotton/ cotton/linen blend in the Mr Porter sale. I have shortish arms and all my other RTW suits have needed alteration, which I prefer to have done from the shoulder as it leaves the cuff as it was intended to be. I don’t have the option of using the services of the tailor where I bought the suits (unless I’m mistaken Boglioli don’t have a London store) and I am concerned that a ‘regular’ alterations tailor (which I have used in the past) won’t be able to replicate the finish on the shoulder, which is quite different from say a Richard James or Thom Sweeney RTW suit. I noticed that you have said in past post that you use Graham Browne for all of your alterations. Is this still the case and if so do you think that they will be able to achieve an alteration like this without changing the look of the shoulder? Yes I’d still recommend Graham Browne and I’d suggest going in and asking them. You should be ok. I am surprised you say Anderson & Sheppard specialise in the extended shoulder. It is a long time since I had a suit made there (I followed their cutter, the late Brian Russell, when he set up on his own), however, they were always famous for their “Scholte shoulder”, which was especially soft and draped. Has that now stopped? I think you look better in that cut rather than the skinny look of jackets today. That’s why Scholte was a genius. It was a timeless creation. Can I make a slightly flippant point, prompted by the last photograph? There was a time when a coat made a bespoke tailor would never have any label visible on the lining; instead there would be a discreet label inside the inner breast pocket with the client’s name and the date of manufacture. I recently asked a tailor I had not used previously to do this only and he was offended! Frankly, I find labels a slight vulgarity, rather like leaving working cuff buttons undone. But it is amazing how many people expect them with such prominence, as if it were a reassurance that the provenance was more important than the craftsmanship or fit, and that others should get a flash of the name when reaching for a pen. Thanks, and I know what you mean. Lovely trousers (sorry, I realise this article was more about the jacket)! Would you wear the opposite colour combination (i.e. navy trousers and grey jacket)? What colour jackets would you recommend with navy trousers? I struggle as I prefer darker colours, especially for relaxed business dinners (so couldn’t pull off a cream jacket for example). I think dark blue trousers are easy to wear; any mid to dark olive or brown glen check, dark brown suede, white, blue or cream shirt. Easy and stylish. Spend some time in Italy Simon; you will see this a lot. We’ll have to agree to disagree then. Hopsack, cord, bamboo all work perfectly well. Mildly tangential, Simon: Do you typically keep your jetted and flapped pockets stitched up or do you use them? 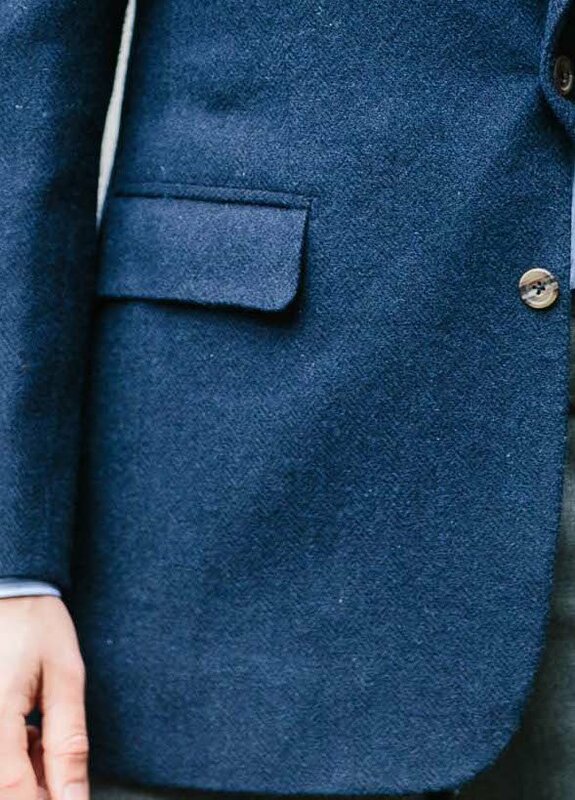 Have you had bespoke coats delivered with pockets stitched shut? I thought that was strictly for the mass produced. Sometimes basted shut, so you have the option to unpick them if you want to use them, but usually not. This is a subject not covered by much of the clothing fora or blogs. It’s not even talked about outside a small band of cognoscenti who are aware of beautiful artisanal details in bespoke clothing. A bespoke tailor stitches pockets shut not only to prevent bits of dust and fluff from entering the said pocket but to display his skill and mastery with a needle and thread. It is to make a statement analogous to “this thread will be plucked out without a care by the owner but for its short life this piece of tacking will be a work of art”. Look for at least 3 stitches per inch to sow each pocket shut. This is the mark of a true master at work. If you find such a man he is worth his weight in gold. Could one contend that the color and style of this jacket lend to it the highest level of formality one could get with tweed? Something quite close to a navy blazer, that is. Simon: would you say that the drape cut/extended shoulder would work better on someone taller/leaner? If someone is on the shorter side, with narrower shoulders, would a more structured suit w/ roped shoulders be more flattering? Rather than saying what is more ‘flattering’, George, it’s best to consider what you are trying to achieve. If you want your narrow shoulders to appear wider, then both roping and an extended shoulder can do that, but an extended shoulder more so. Roping will also be a little more dramatic and sharper – so you should consider whether you want that effect as well, or not. Dege and Cifonelli are rather different, the former relying more on padding and the latter on roping. one last question: any recommendations on house styles that might be in the range of what I’m looking for? Reading your articles makes me think that Dege/Cifonelli/Camps de Luca/Huntsman might work? Yes, all four would be good – the English both different in style to the two French, however, so do consider which style you prefer. Fantastic post. Very interesting discussion of how small changes can have quite an effect on the overall look. The internal pocket shown in the picture doesn’t have the strip (made of the same fabric as the jacket) around it like many of your other jackets. I’ve read that this ‘lining only’ pocket is weaker and it also makes the lining harder to replace. Is there any veracity to these claims? Its a good look, though the jacket looks a little off in silhouette. I think the mix of peaked lapel and flapped pockets (vs. welted or besom) to be slightly incongruous eps. given the weight of fabric. I agree with Inkster, slanted pockets would have lengthened as well as adding a touch of sportif – the pockets would have to be matched with notched lapels. Thank you for the detail shot of the trousers – they look to be be very well cut. 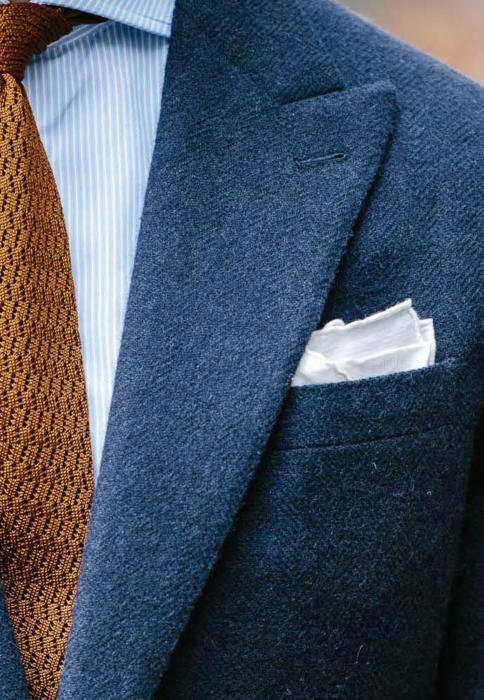 However its the Shibumi tie that gives the outfit elan – beautiful. Overall an excellent look, thank you for featuring this collective. Notch lapels on a single breated sit best with a Dinner jacket. On tweed they are a laughable nonsense from somebody who suggests he knows a lot but who seemingly knows very little. Oh dear. Notch lapels on a dinner jacket? Meant to say peak lapels for a DJ. Peak on an SB suit or jacket looks more like Reiss or Next. I can empathise with that view on an SB suit or jacket, but personally I like it when everything else is very understated. Simon, I really admire the courtesy and “coolheadedness” with which you respond to some frankly obnoxious comments (I also remember a few nasty ones following your review of P. Johnson). I’d really like to know what your philosophy is on that matter. Thank you, David. My philosophy is that I want an open forum, where people are free to criticise my choices and points. None of this is completely objective after all. But at the same time, if someone makes a comment that makes no substantive contribution to the discussion, or is abusive of myself or anyone else, I will not publish it. I feel that latter point is what’s often missing in most other forums – an informed and consistent moderator. Yet sometimes you allow what I feel are very rude comments, even personal attacks, and still take time to address the questions they contain while remaining courteous. That says a lot about a person. So I guess my question was more about your philosophy in life, how you deal with rude people, harsh criticism etc. Anyway, cheers! Ah, I see. Sometimes it’s worth publishing those, just to show the commenter up or to use it as an opportunity to re-state our policy. ….On second look I can see why you went for peaked lapels, they lead the eye up and give width to the shoulders, so the experiment worked. I still would have gone for besom pockets, but understand that they may have been too formal for the style and cloth. All the same it is one of your best combination outfits. Probably not, no. The jacket is too structured and formal. Let’s say if it’s stylishly made by Caliendo. Would the texture, colour etc go with jeans? A question about the tweed: isn´t herringbone tweed (beautiful as it can be) so extremely classical that it has less potential for a contemporary look (just like corduroy)? Last year Drake´s used a non-herringbone tweed for a navy jacket. Wasn´t that to avoid the clichè? I know what you mean, but being a herringbone or not doesn’t make a big difference – particularly when it is as subtle a pattern as here. 1) What prompted you to favor the peak lapel in this instance, as I know you have been loath to employ it on SB in the past. 2) The padded shoulder versus drape debate seems endless, does it not? I’ve had one tailoring house denounce it while another swears by it. My own shoulders slope but the drape cut does seem more “natural,” if that is a fair word to use. Would you recommend this tweed for an casual patch pocket jacket to be worn just on weekends? Is it that formal due to the colour? Pattern? You just convinced me. I am going to comission a bespoke jacket. Considering that most of my casual trousers are really casual ( burnt orange, red…) the formality of this tweed can match it perfectly well. Would you recommend their mtm option as a cheap source for odd trousers, Simon? I agree, I just think the knot is a little out of proportion. Also to be clear, I wasn’t suggesting a different type of tie knot, just a different (wider or thicker) tie, so the four-in-hand would be longer/wider. It is very hot where I live and the dress code is extremely casual. This is part of the reason there aren’t many tailors here. The ones that are around are old, and mid to low range. 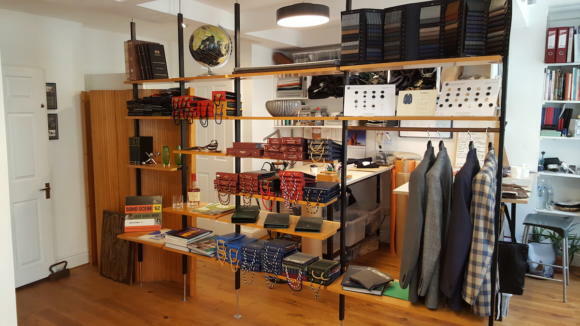 They do not make a distinction between Made-to-Measure and bespoke. That also means lack of cloths: I couldn’t find Hopsack here. So my first question would be: what could act as a substitute for hopsack to create a casual unstructured blazer? Regarding fit: I am a tall (1.90+), wide, rather fit man. I work hard at developing a natural impressive silhouette. But the fact that I am considered an overdressed person here combined with my larger than average physique presents a dilemma: should one emphasize one’s natural physical traits with a structured suit jacket, or should one try to downplay them to be less conspicuous than one already is? I understand this is a matter of preference and of specific circumstances, but since tailors here offer little to no advice and since there is very little variety to begin with, I turn to your thought on the matter. Ask for a summer jacketing, and look out for one that feels particularly dry and has more texture than most. Interesting point on your physique, and as you say it’s a personal choice – very up to you on the impression you want to give. Personally I would err towards something softer, but that is personal. Thank you so much for your answer – it helps me out a lot. I spend most of my days reading (academia), and your site is an oasis of fine and precise writing. While I cannot afford most of the items you review (again, academia), I learn a lot about the principles of style. The total lack of sartorial tradition where I live, leaves this kind of knowledge out of reach through the traditional channels (parents, tailors, salesmen), and most sites discuss these matters in a shallow ‘how to…’ format. Your writing and reviews are intelligent and I enjoy PS immensely. I would love to see, however, more ‘philosophical’ writing – i.e. discussing the principles of style rather than their practical aspects. While they are certainly in extant within your pieces, a more methodological post will be fascinating to me. Thanks, that’s lovely to hear. If I could give you my two cents I’d avoid structured tailoring if it’s hot where you live. Reason being heavy canvassing and padding creates more insulation which makes it wear warmer. A structured jacket is like wearing two unstructured jackets on top of one another. Thank you so much for your reply. Your two cents are dollars to me. This is a wonderful piece of advice. Unfortunately, tailoring here is so bad, when I try to describe canvassing to tailors the know not what I mean. They (the few that are still alive) create fused jackets. This does solve the question of ordering MtM suits online vs. having them made here. If I were you I’d go abroad then, online is a disaster waiting to happen, commission perhaps just one piece like a sportsjacket then start wearing to see if it works in the hot climate and in a very casual society. I love tailoring and started having structured English garments made but to be honest it doesn’t fit my current lifestyle well at all now as I go to very informal places socially and my work doesn’t require a dress code. You have to balance what you like with what actually works for your lifestyle. It’s tricky as in the modern world our lives are often in flux with changes of career and different social venues we may stop or start visiting. If you’re not careful though you’ll end up with white elephants in your closet that you hardly wear! As a fellow cyclist I had the misfortune to come off my bike a few years ago and do a grade 3 AC separation (the ‘bump’ is very noticeable). In regards to having my first MTM suit (I am 26), what would you suggest I do in regards to shoulder padding? Do I embrace the bump or opt for some thicker padding to hide it? Quick question. In regards to the extended shoulder, I was wondering what is the difference in shoulder measurement from your Neapolitan jackets to jackets with an extended shoulder i.e. this one or Vestrucci or Liverano? Thanks in advance (PS – can’t wait for the Vestrucci review). It varies from around an inch to half an inch. Thank you for your swift and helpful responses in the past – definitely the first I’ve come to about the following! I’m a young guy starting to delve into the bespoke world, thus have made a few mistakes up to this point! I have a suit made a few years back in a lovely solaro fabric, yet the shoulders are too bulky for my liking – too much padding etc. 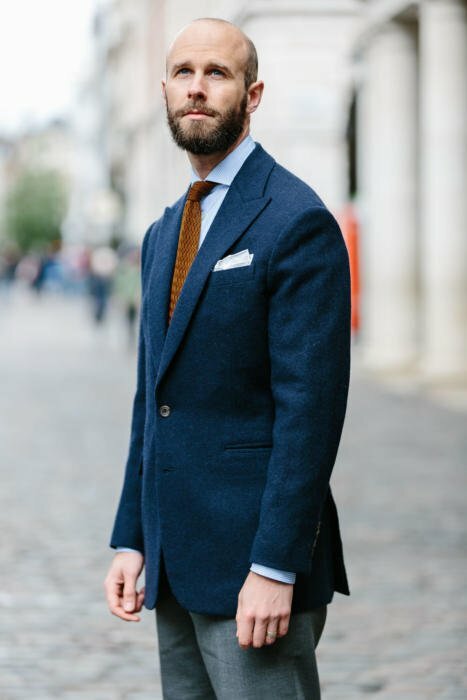 Would you recommend a London-based tailor who could see to making the shoulders more natural? I spoke to the original tailor (Bookster’s) but they turned me away, claiming it was too difficult and recommended I simply start again. What are your thoughts on this? Many thanks for your time, I know it is limited. The tailor is right, it’s a huge job and unlikely to turn out satisfactorily. I would look to buy something new, probably, rather than risk spending some decent money and still not ending up with what you want at the end.